Paro Tshechu is one of the most famous festivals in Bhutan. Throngs of people,travel from around the world and neighboring districts to participate in the festivity. On the last day of the celebration, a gigantic Thangkha (Thongdrel) of Guru Rinpoche will be displayed inside the Dzong. The Thongdrel will be displayed early in the morning and for a few hours only. It is believed that one can cleanse their own sins upon viewing the Thongdrel. When you first arrive at Paro International Airport, you will be met by one of our delightful tour guides just outside the arrival hall. 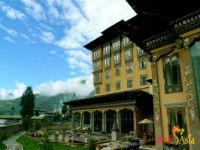 At 7,333 feet above sea level, the first thing you will likely notice is the effect of the high altitudes, so we will give you time to acclimate as we take a short drive to Thimphu and check into your hotel. Thimphu is the capital of Bhutan and the perfect location to transition from your familiar lifestyle to our unique country that is like no other place on earth. Here you will begin to appreciate our local customs as you get your first glimpse of monks dressed in traditional red robes, men in striped ghos, and women in brightly colored kiras. 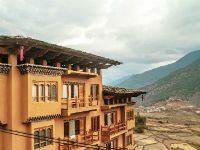 Once you settle into your hotel, we will begin to unlock the mysteries of Bhutan by touring Thimphu’s most important sites. The National Memorial Chorten was built in 1974 to memorialize Jigme Dorji Wangchuk, the third king of Bhutan (1928-1972). A chorten is a stupa, or hemispherical structure, that is used as a place of meditation. The whitewashed building with a golden finial on top is a popular location for prayer as it represents the strength and kindness of our beloved third king. The Thimphu Tashichho Dzong is a fortress and Buddhist monastery with a distinctive Bhutanese architectural design. Sitting aside the Wang Chhu (river), it is the current seat of the Druk Desi, the head of the civil government, and houses the offices of the current king. On the weekends, Centenary Farmers’ Market is where farmers come to sell their vegetables, cheeses, grains, and the occasional yak leg. Across the street is the Kundeyling Baazam where you can bargain for local handicrafts, such as mala beads and prayer wheels. We will then take a scenic drive up to Buddha Point in the Kuenselphodrang Nature Park to see the 169-foot-tall bronze statue of the seated Buddha Dordenma. One of the largest sitting Buddha statues in the world, it sits atop a hill where you will see sweeping views of the valley and surrounding mountains. After returning to town for dinner, you can wander through the shops, bars, and cafes of Thimphu. Today we travel to Punakha, the former capital of Bhutan until 1955, and will stop off at Dochula Pass along the way. This popular tourist spot provides stunning 360-degree views of the Himalayas. It is also home to the 108 Druk Wangyal Chortens that were built on a small hill to memorialize the Bhutanese soldiers killed in a 2003 battle with Assamese insurgents from India. The Druk Wangyal Lhakhang temple was completed in 2008, built to commemorate 100 years of monarchy and His Majesty Jigme Singye Wangchuck, the fourth king, and leader of the raid that removed the Indian rebels. 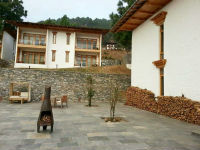 We will tour what is considered one of the most beautiful site in Bhutan, Punakha Dzong. Sitting at the fork of two rivers, it is a stunning example of Bhutanese architecture. Built in 1637, it is the second oldest and second largest dzong in Bhutan. Jacaranda trees surround the structure that produce stunning lavender blooms in the spring. The massive structure is six stories with a central utse (tower) that stands 3,900 feet tall. Inside the fortress, there are three large courtyards, one of which houses the well-preserved body of Zhabdrung Ngawang Namgyal, the 17th-century father of unified Bhutan. It was also the location of the royal wedding of Bhutan’s current king Jigme Khesar Namgyel Wangchuck to Jetsun Pema in 2011. We will also visit Khamsum Yulley Namgyal Chorten, which is a splendid example of Bhutanese art meets architecture, and the only one of its kind. At the direction of the third Queen Mother Ashi Tshering Yangdon Wangchuck, the site took nine years to build because architects, painters, sculptors, and carpenters only used holy scriptures rather than engineering manuals to construct this four-story temple. Only reachable on foot, the hour trek includes an exhilarating walk across a colorful prayer flag adorned suspended footbridge that crosses the Mo Chhu. In 1999, the temple was consecrated to remove negative energies and promote peace, harmony, and stability around the world. It is a stunning building with splendid views of the valley that are well worth the walk. Following an overnight stay in Punakha, we head toward the remote glacial valley area of Gangtey. We will stop near Sopsokha for a short walk across terraced rice fields to the temple of Chimi Lhakhang. Located on a hillock, this temple is dedicated to Lama Drukpa Kuenlay, an eccentric religious teacher of the late 15th-century who used humor, songs, and outrageous behavior to share his teachings, earning him the title of Devine Madman. Also known as a fertility temple, women travel there to pray, and it is rumored that many become pregnant shortly after. Chimi Lhakhang has a very peculiar design aesthetic, as you will find colorful phallus symbols painted on the buildings throughout. We pass through Wangdue, the last town before entering the isolated areas of central Bhutan. Dramatically perched on the side of a hill, we will see Wangdue Phodrang Dzong. Unfortunately, a 2012 fire gutted the building, so we are only able to view it from the outside as reconstruction is underway. Wangdue has a small market and the area is known for its fine bamboo work and stone carvings. We will also see the Buddha face, a natural phenomenon that has seemingly formed out of natural rock. Traveling through the pristine mountains of central Bhutan, we enter the Phobjikha Valley, also known as the Gangtey Valley. This bowl-shaped valley borders the Jigme Singye Wangchuck National Park, and the entire area is a wildlife preserve. Here you may see the black-necked cranes (Grus nigricollis) that migrate here from November to March. You might also see other native animals, such as muntjac, sambar, serow, leopard, red fox, or yak. On a hill overlooking the entire valley is the Gangtey Goempa, a large 17th-century monastery. The tshokhang (prayer hall) was built in Tibetan style and has eight great pillars. A five-day teschu (festival) is held here every fall where locals and monks perform traditional dances with colorful masks and swords to ward off evil spirits and celebrate the harvest. Here you have the option to stay in a hotel or take the rare opportunity to room with a local family. Typically staying in a modest farmhouse, you will immerse yourself in family culture and share in their gracious hospitality. Today we head back to Paro and the scenic beauty of the Paro Valley. This area has many monasteries, temples, dzongs, and natural wonders that make Bhutan such a breathtaking country. Located on the northwestern border of Bhutan and Tibet is Chomolhari (Jomolhari) Mountain. At 24,035 feet it is Bhutan’s third tallest mountain peak and is often referred to as the wife of Kangchenjunga, the third tallest mountain in the world. Glacial waters flowing from the mountainous region feed the Paro Chhu and Amo Chhu rivers. The Rinchen Pung Rinchen Pung Dzong, usually called Rinpung Dzong, means Fortress on a Heap of Jewels as it was built with stones rather than clay. It is considered one of the most impressive dzongs in the country and the finest example of both 15th and 17th-century Bhutanese construction. Located on the Paro Chhu just north of the airport, the fort was used to protect against Tibetan invasions. In 1907, it was damaged by fire and in 1969, the cantilever bridge was washed away by a flood. The restored dzong now houses monastic, government, and judicial offices. Nearby is Ta Dzong, a cylindrical seven-story watchtower built in 1649 that is now the National Museum of Bhutan. This museum houses artifacts, weapons, textiles, and fine Bhutanese art from 4000 BCE to the present. The building is a conch shape with spiral construction inside and out. On our final tour day, we take an exhilarating one-hour hike to Taktsang Monastery (or Tiger’s Nest), one of the most recognizable sites in Bhutan. Built precariously on a hillside cliff, it sits more than 10,000 feet above sea level. Accessible only by foot, we follow a trail decorated with colorful prayer flags along the way to protect travelers from evil spirits. Built over the caves that Guru Padmasambhava meditated in for three years, this eighth-century father of Bhutan Buddhism is said to have been brought there on the back of a tigress. One of the most sacred sites in Bhutan it offers breathtaking views to those energetic enough to make it to the top. We then take a short drive north of Paro to visit the ruins of Drukgyal Dzong. Built in 1647 by Zhabdrung Ngawang Namgyal, the unifier of medieval Bhutan, it was used as a stronghold against invading Tibetan armies. After a fire destroyed it in 1951, it remains a ruin as a symbol of the past military victories. On clear days, you can also see the snowcapped peak of Chomolohari mountain. We visit to Kyichu Lhakhang, a beautiful seventh-century Buddhist temple, one of the oldest in Bhutan. According to legend, a giant demoness lay her body across the Himalayas to prevent the spread of Buddhism. Tibetan King Songtsen Gambo built 108 temples throughout the region and around her body to pin her down, with Kyichu Lhakhang built to hold down her left foot. The Paro Tshechu, as all Tshechu festivals, honors Padma Sambhawa, also known as Guru Rimpoche, the precious yogi and saint who is credited with having introduced Tantric Buddhism throughout the Himalayas. The festival’s masked dances are performed by monks clad in colorful brocade attire and permeated by chants and reading of Buddhist scripts. 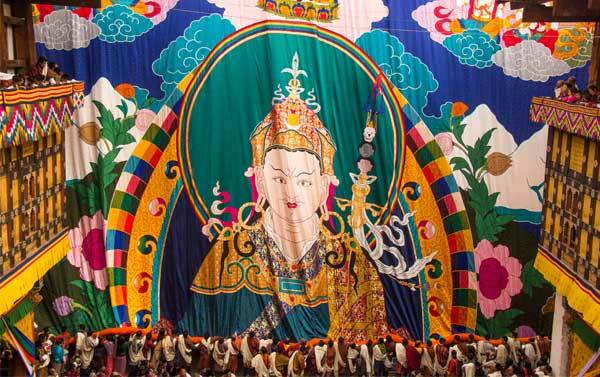 The culmination of festival constitutes the unfolding of a huge cloth thanka, a sacred scroll, depicting Padma Smabhawa and imagery from Buddhist pantheon. Bhutanese people can be seen wearing their best and colorful national dress making the already colorful festival even more colorful. Today we will bid fond farewell to this beautiful Himalayan country and take an early flight back to Singapore. We hope by now you would have made some friends and also kept many photos and beautiful memories of Bhutan! And we look forward to seeing you again in this beautiful land of endless Enchantments! You're right tears almost drop when Tashi wave 👋🏿 good bye at airport. We are pleased that we made the right choice to travel with Druk Asia. I'd like to compliment 3 of your employees, Sonam Younten, Nawang Tshering and Ugyen Tenzin (aka Zang Po/Shang Po) on the excellent services they have delivered. First of all, our very first contact from Druk Asia, Sonam Younten. He has been very patience, fast response to our queries and more importantly accommodate to our many requests. Our tour guide, Nawang Tshering is a friendly, helpful & informative guide. He is also knowledgeable and gave useful tips during the tour. We appreciate his patience and enjoyed the meaningful stories and history lessons that he shared. To suit our physical constraints, Nawang was very considerate and encouraging especially on our first trekking trip to tiger nest. We had such an amazing time in Bhutan. It was so difficult to say goodbye! My sister and I cannot sing enough of our praises for Druk Asia - especially our guide Tshetrim and driver JamYang. Tshetrim was an awesome guide. He was knowledgeable, professional and an absolute gentleman throughout our stay. He definitely went above and beyond to make our time in Bhutan memorable. We even had other tourists comment on how thoughtful Tshetrim was. JamYang was experienced and skillful in his driving. We always felt safe with him behind the wheel. We owe so much of our wonderful experience in Bhutan to the both of them. Thank you also for arranging an upgrade of our hotel rooms. We have only praise for all the places we stayed especially Zhiwaling - such a beautiful hotel.